The recent murder of 37-year old African American Alton Sterling by police in Louisiana is another tragic episode in the long chain of racist crimes in the U.S. The United States of America- the metropolis of Capitalism- has a devastating tradition of racial discrimination. A tradition of human chattel slavery back in the 18th and 19th century, of lynchings and mob violence against African-Americans, of racial segregation and discrimination against black people in the post WW2 decades. Racism is an inseparable element of the capitalist exploitative system; it is in the very nature of Capitalism to produce, promote and feed racism. After all, the exploitation of the working class by the capitalists becomes easier and more effective when there are divisions among workers. For that, racism consists a valuable tool of the capitalist establishment in creating disunity within workers. What is best for the exploitative system rather than a splitted working class, filled with racist poison? Writing for TIME magazine, after the murder of Michael Brown by a police officer in Ferguson, Missouri, the former basketball legend Kareem Abdul-Jabbar was correctly pointing out: “And, unless we want the Ferguson atrocity to also be swallowed and become nothing more than an intestinal irritant to history, we have to address the situation not just as another act of systemic racism, but as what else it is: class warfare” (TIME, 17 Aug. 2014). Indeed, the racially motivated crimes must be seen not as an exclusive and separate issue of “racism” but within the context of class warfare. The intense class warfare in the U.S. reflects the harsh reality behind the curtain of the so-called “American Dream”. 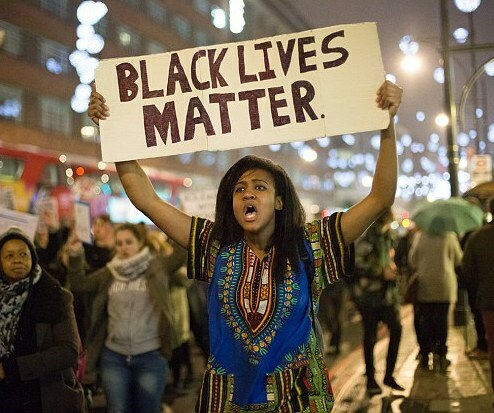 In a period of 33 years, from 1980 to 2013, 262,000 black males were killed in the United States ("A Matter of Black Lives", theatlantic.com). This number is more than four times bigger than the number of Americans killed in the imperialist Vietnam War. In 2015, U.S. police killed at least 102 unarmed black Americans (MappingPoliceViolence.org), while the rate of death for black men was five times higher than white men of the same age. The police brutality against African-Americans goes hand-by-hand with the rise of racist, neo-fascist white supremacist groups in the country. According to the Southern Poverty Law Center, the U.S. hate groups including the notorious Ku Klux Klan have increased dramatically in the past year- in the multicultural metropolis of Capitalism (U.S.) there are 892 active hate groups, including neo-Nazis, racist skinheads, white nationalists, fundamentalist christian groups etc. The vast majority of these hate, racist groups are based in Texas, California and Florida. During the last years of the capitalist crisis, in both the U.S. and Europe, we have seen the rise of far-right, fascist and racist groups and parties. Despite the distance, the cultural and political differences, the root for the strengthening of such groups is the same in both the two sides of the Atlantic: the need of the capitalist system to keep the workers, the low-income people divided, by reproducing waves of racism, nationalism and bigotry. The fake divisions within the working class (e.g. white versus black workers, local workers vs immigrants, etc.) consist an extremely comfortable situation for the monopolies and their profitability. There are countless examples which prove the abovementioned argument. However, we can only refer to a characteristic one – the 1994 case of Texaco's corporate racism. In 1994, Texaco- the 14th largest corporation in the U.S.- was hit by a $520 million racial bias suit. The suit, filed by six African-American employees on behalf of 1,500 other employees, asserted that Texaco "systematically discriminates against minority employees in promotions and has fostered a racially hostile environment." A large number of black employees had then testified about racist incidents at Texaco. Later, The New York Times obtained thousands of pages of sealed court records, as well as government documents, corporate records and sworn depositions, which exposed how systematic, racist policies thrived at Texaco. The supposed “equal opportunity” promoted by the “American Dream” hides numerous cases like Texaco; cases of racial discrimination, of openly hostile environment for workers, of capitalist terrorism. The conclusion is: Black Lives Matter, but not in Capitalism. In the capitalist exploitative system what matters is the profit of the capitalist. Everything else (including, of course, human life) can be sacrificed at the altar of profit. As Malcolm X, a non-communist but nevertheless an honest fighter for civil rights, once said “you can't have Capitalism without racism”.